The big buzz in the Appleverse lately has centered around the recent release of Mac's new operating system OSX 10.7, better known as Lion. I thought it might be a good topic to post about, to let you know why you should care about this if you are a Mac or iDevice user. 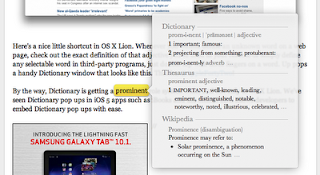 Chiefly, if you have a newer Mac, you might want to consider upgrading- Lion's features are way cool! Secondly, you may be encountering computers that have Lion installed- yours or your school's- and it will be helpful to know the differences if you are working solo or with students using these Macs. First of all, it's important to clarify what an operating system is- it's basically the nervous system of your device, controlling the look and feel of what it is like to use the device and how applications (or apps) interact with each other. Mac laptops and desktops for the last 10 years have run versions of OSX named after cats: Cheetah, Puma, Jaguar, Panther, Tiger, Leopard, Snow Leopard and now Lion. I am guessing the next release will be called "Mangy Stray!" Apple tends to update its operating system more incrementally and frequently than PC/Windows updates occur. The hallmarks of OSX are its ease of use, the "Aqua" theme that uses a lot of softness and translucency in the look of windows and such, and, important for us to know about and worthy of a post of their own, built-in accessibility options that make it easier for those with disabilities to use the computer. If you have an iDevice (iPad, iPod Touch, iPhone, and even Apple TV), these have a different operating system known as iOS. Your iDevices are not affected by this recent release of OSX, but will be affected when iOS5 comes out this fall, with its own set of cool enhancements. One of the key things to know about Lion is that it is being seen as a significant step in Apple bringing its two operating systems closer together. 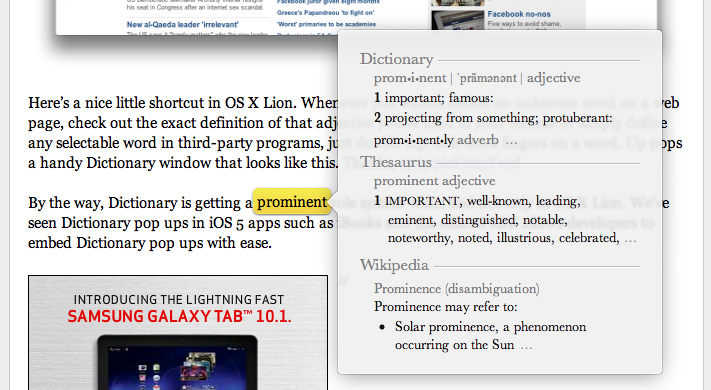 This similarity is present in at least 4 enhancements in Lion. "Multitouch Gestures" similar to how one interacts with an iPad are more extensively available in Lion, therefore basically killing the mouse and the "click" (though you can customize which gestures you want turned on). This video from Apple gives a great overview of the gestures available. 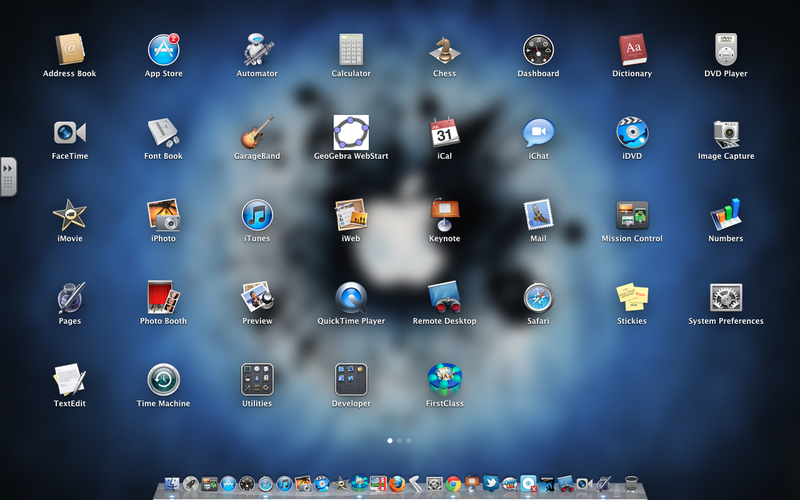 You'll really only be able to access these if you have a newer Mac with the multitouch trackpad (i.e. it does not have a button) or you buy a separate accessory such as a Magic Mouse. Note also in this video the demo of two other new features similar to iOS, the availability of "Full Screen Apps" and "Launchpad," which brings up a screen of your installed apps that looks just like your iDevice app arrays on your home screen. Additionally, OS Lion represents a stronger integration of the Mac App Store introduced in a later version of Snow Leopard. For the first time, if you have the Mac App Store available (meaning, you have Snow Leopard), you can install the new operating system as a download right from the store (running you $29, not all that expensive at all)! Traditionally, operating systems were distributed by CD-ROM. If you'd like to buy OS Lion and your Mac is more than 2 years old, you may want to check with or call the Apple Store first, to ensure your machine can support it. I'd like to recommend that you take a look at the features of Lion, and this link shows you how to use some of these, but I want to also quickly list some of interest (or concern) to SLPs. Resume and Versions- Mac apps will now re-open exactly as you left them. Meaning, if you quit Pages or Keynote, when you re-open, the file you were using will be there. Similarly, Safari will re-open with the last tabs you had open. This is handy should kids accidentally quit, or forget to save their work! Versions allows us to autosave and go back to all previous versions of the document, similar to the way that Google Docs keeps revision histories. Safari enhancements- Mac's main web browser is now viewable full screen like all other apps made by Apple (which helps to remove desktop distractions). It also has an autocorrect feature that helps avoid misspellings, or perhaps just result in annoyance and hilarity. Additionally, you can now save any webpage in a "Reading List" (just click the eyeglasses in your bookmarks bar) to read later- handy for your professional development. Multitouch gestures- I'll mention these again as a possible concern; I find them very useful as a user, but many of our kids with fine motor issues may have trouble keeping track of and/or executing the gestures. It's important to note that you can set up a separate login on your computer for students to use and go into System Preferences>Trackpad to customize which gestures are active. It is also helpful that all the traditional mouse gestures- click, double-click, and drag- still work when you have the multitouch gestures active. Accessibility- these improvements allow you to customize the voice on VoiceOver and text to speech, and perhaps my favorite, you can look up a word in the dictionary by double-tapping with 3 fingers on a word! Handy for vocab-challenged kids! If you do not have admin rights on your computer (and I know many school-based SLPs do not), please know that I don't mean to frustrate you by dangling a carrot you cannot yet obtain. If you do install Lion and you are annoyed by any of the new features, here's a nice guide to how to selectively shut features off! It's impossible to provide a comprehensive overview of Lion, and this has become a lengthy Roar, but I hope it gave you enough of a taste so that you might want to look into how this OS can be useful to you as an SLP. Thanks for this column. I am still "playing" with Lion & still learning. I like it so far. I know it won't be on my work computer and that's the part that may become frustrating. Many of us will be operating on two different operating systems. Oh well. Good thing that Speechies are flexible as well as intelligent, caring, fun to be with ... I could go on & on!